Here all Banglalink customers are eligible to activate Banglalink Pohela Boishakh Offer 1GB 14Tk. 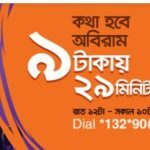 Bangladeshi most popular and one of the biggest telecommunication company BL has come to their valuable customers to activate 1GB Internet 14TK Pohela Boishakh Offer. We all know that, BL all times brings to super and low price internet and call rate offer for their valuable subscriber. The users who want to know about this special internet offer, just waste some time with us and read this full content with attentively. Here you will get all more instruction to activate this special offer. Now BL all subscribers are eligible to activate 1GB internet pack at only 14 taka, valid for 24 hours. To activate pack, dial *5000*14#. To check volume and validity of the pack, dial *121*14#. 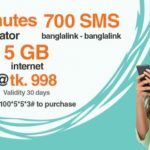 Any Banglalink Prepaid and C&C subscriber can purchase the data pack. The subscribers can purchase the internet pack as many times as they want. Now all users have got more information about the Banglalink Pohela Boishakh Offer 1GB 14Tk. If you want to know more or faced any problem to activate 1GB 14Tk offer, just comment the box. Thanks to all fir being here.